Here's a quick walkthrough and strategy guide for the action RPG third person shooting game - Fantashooting 2. This guide will only cover the Pumpkin Town Stages 41 to 80, and will focus on using Ranger Jenny as the primary Hero. Shepherd Sam is also ok, just follow the guides below too for upgrading. Refer to the links below for more useful tips and reminders. - Crude Novice Frozen Arrow or Ice Wand (Get Sapphire at Stage 3). No need to upgrade, just use it to slow down fast moving enemies, then use your main weapon to defeat them (Slow + Unique Weapon Combo). - Suggested Farming Stages: 41,42, 44, and 45 gives around 1,000 Gold (depending on drop chance). - Stages 51, 57, and 71 are awesome too once you get there, or any stage you like to replay. - Unlocked Heroes: Purple Rope Ellen and Shooter Gina. - Both are great but I would still suggest that you stick with your current Hero to unlock more greater Heroes. - Unique Skill Lv 7. - Try to eliminate all pumpkin plants before they sprout out more. Watch out for their homing roots. - Unlocked Heroes: Noble John and Pumpkin Parker. - Both are great too, but I would still suggest that you stick with your current Hero to unlock more greater Heroes. - This is a nice farming stage, including Stages 41,42, and 44. I suggest you buff up your weapons and skills here first before proceeding to the next stages. Come back here if you need to get more Gold for upgrades. - Aim for Exclusive Weapon +20 (Tier 4 Weapon +2) and Unique Skill Lv 10. - Unique Skill Lv 10. 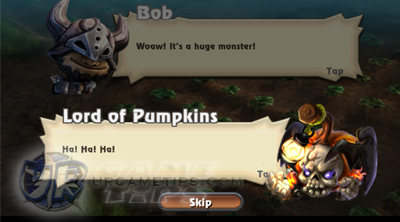 - Jumping Giant Pumpkins: You must use Dash and move away every time it starts to jump to avoid it's wide Area of Effect. If you see it burning, move further away because it will dash towards you. - Use your Crude Novice Frozen Arrow or Ice Wand to slow down enemies chasing you, then hit them with your main weapon. - Should be easy, just dodge Chiblins' ("Chicken - Goblin") projectile attacks. - If needed, use your Crude Novice Frozen Arrow or Ice Wand to slow down those chiks. - Same with Stage 50 above. - Bats are fast, but this should be easy since you have a nice upgraded weapon. Use your Crude Novice Frozen Arrow or Ice Wand if necessary. - Unique Skill Lv 12. - Note: If a boss monster stops chasing you, it will use it's skill. - Keep moving and keep your ditance from the Bat King to avoid it's projectile attacks (summons bats). Note that it's bats will chase you after they are used as projecticle attacks, so move to the sides and don't go near them. After that, defeat all bats first and use your skills wisely to hit and defeat the boss here. - If you are having trouble, upgrade your weapons and/or skill. Stage 57 is a nice farming stage at this moment. - Orcs! They are tough and somewhat fast, so use your Frozen Arrow or Ice Wand to slow them down, move away then attack using your main. - Stay away from those Bombs, use slow or dash away. Try to defeat Orcs that are holding crossbows to deal auto-damages to those Orcs, or use slow on those bombs, then explode it once the Orcs are near them. - Quickly eliminate all plants and lesser Orcs to give you more space for the Orc Boss. - If you are having trouble, upgrade your weapons and/or skill. Stage 57 is a nice farming stage at this moment. Stage 61 is also ok with 20 Stamina per game. - Watch out and avoid projectile attacks (rocks), keep your distance from those rock throwers, and use slow + unique weapon combo to deal damage before they use their skill. - Quickly detonate bombs, or use slow on them, then try to detonate together with other enemies nearby. - Unique Skill Lv 13. - The Orc Raider boss here is super tanky with it's shield on, just use slow + unique weapon combo if they are near, do this until the Orc boss drops it's shield. Try to defeat Orcs that are holding crossbows to deal auto-attacks into those group of Orcs. - Include Stage 66 strategy. If you need to farm Gold, replay Stage 69, 61, or 57. - Nice farming stage, Orcs will drop 500+ Gold Coins. - Goblins here will throw out lots of bombs, the good news is, you can hit them, so just keep away, sweep all mini bombs, and use slow + unique weapon combo. - If you are having trouble, upgrade your weapons and/or skill. Stage 71 is a nice farming stage. - Unique Skill Lv 14. - Jumping Giant Pumpkins: You must use Dash and move away everytime one of them starts to jump to avoid it's wide Area of Effect. If you see them burning, move further away because it will dash towards you. - Might be helpful if you clear all lesser monsters first before the 3 giant pumpkins. - Unlocked Hero: Clown Carlo! - Unlocked Hero: Bully Bob! - Also an ok Hero, his passive skills are somewhat situational though. - Unique Skill Lv 15 or better. - First you will be encountering some bosses from the previous Stages like Bat King and Orcs, just keep your distance and use same strategy, slow + unique weapon combo. - The Lord of Pumpkins: Summons pumpkins to slow you down, and bats to attack you. Like always, keep your distance and attack the boss after clearing lesser enemies around.